Before you squirt any polish on your guitar, you need to clean it first. Wait! Don’t squirt polish on that guitar yet! 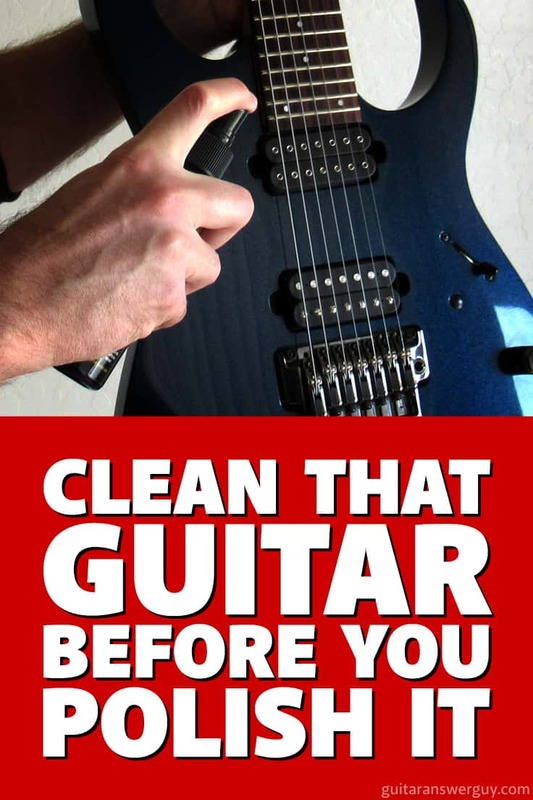 Well, if this was common sense I wouldn’t be seeing legions of people, day after day, reaching for a bottle of guitar polish to “clean” their guitars. If there’s any significant dust or dirt sitting on your guitar’s glossy (or satin) finish, you’re just going to smear it around–essentially micro-sanding your lacquer or, worse, outright scratching it. This is why dark-colored guitars can develop dull, hazy areas after a few years of well-intentioned polishing. So, don’t use a guitar polish as your very first (or only) step in cleaning. First, remove any significant dust, dirt, sweat, and oils. 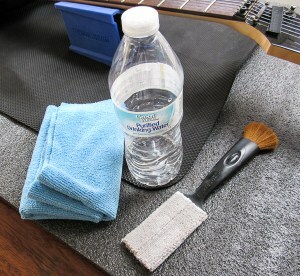 In this post, I’ll show you how easy (and cheap) it is to clean your guitar without any specialized cleaners. Get that otherwise clean-looking guitar under the right light and all kinds of crap is revealed. Not only did I find a ton of dust, I found a small metal flake, dog hairs, and a smudge from my dog’s nose. And this is just the front of the guitar! Whoa! If I’d just squirted guitar polish on there, I’d have been smearing all that stuff around on my finish. The dusty stuff and dog hair probably wouldn’t have done any obvious damage that could be seen with the naked eye, but that mysterious flake of metal definitely would’ve scratched my pristine, glossy finish. The basic cleaning method I’ll outline here is for guitars that have a hard gloss or matte/satin lacquer finish of some sort. 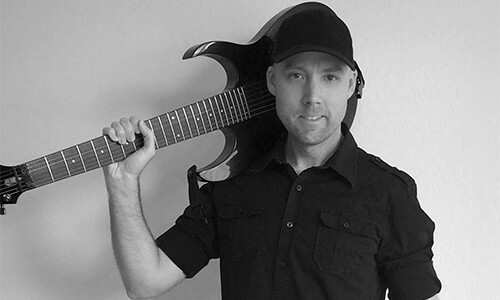 If your guitar has what appears to be a natural finish, skip to the end–to the section titled “If Your Guitar Has a Natural Finish.” You do NOT want to use water or cleaning products on a guitar that has some type of natural (non lacquer) finish, because they can soak right into the wood and permanently stain it. I’m not going to go into heavy-duty, advanced cleaning or finish restoration techniques in this article. This outlines “basic cleaning” of a guitar that’s dusty, smudged with fingerprints, and may have some minor sweat and oil build up where you’re forearm and hands have been touching it. I also won’t be covering fretboard cleaning. That’ll be another blog post… coming soon. This is all you need for basic cleaning. Bottled water, a microfiber cloth, and a very soft-bristle brush. I use the Music Nomad String, Body, & Hardware Tool. Bottled water. Home-filtered water may work too, I’ve just never personally tried it. Cleaning cloth. I prefer the a microfiber cloth for its high pile and extra softness. A very soft-bristle brush. I love my Music Nomad Tool (pictured here), but a sable makeup brush works well too. Your hot breath. Don’t worry, I’ll explain below. Saliva. Seriously, stay with me here. Remove your guitar strings and use a very soft brush to gently sweep over the entire guitar to remove larger particles of loose dust and dirt. 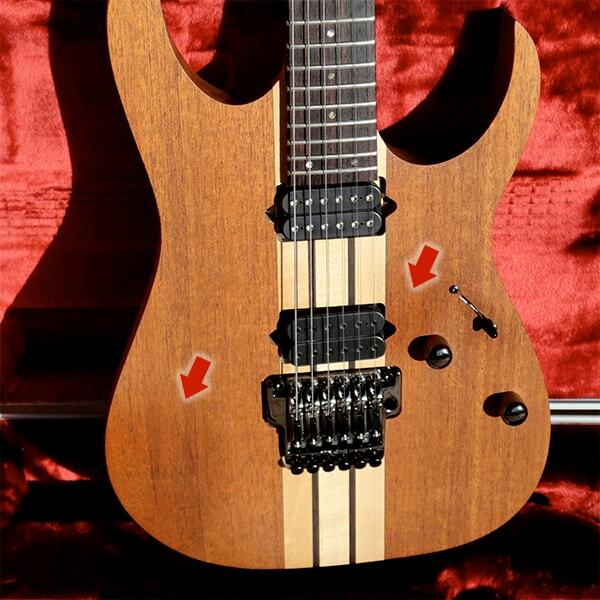 Be sure you get between the pickups (if it’s an electric guitar) and between all the tuning pegs. Use the bristles to get down into little crevices and corners. I want to clarify what I mean when I say “soft brush.” A standard paintbrush from the hardware store just won’t do here–regardless of how soft they may feel to you. My favorite type of bristle is soft, natural sable. For years, I used a women’s makeup brush–the biggest type, which I think is used to apply blush. Or, an even better tool is the Music Nomad String, Body, and Hardware cleaning Tool. It’s actually 2 cleaning tools in one, and I love mine for sweeping away dust and dirt, as well as getting into hard-to-reach places while the strings are still on the guitar. One note of caution: because they’re so fine, these sable brushes can occasionally shed a bristle here and there. If this happens, just blow them off the guitar before moving on. Grab your soft-bristle brush and get ready to go to town. Now that we’ve removed all the loose stuff, let’s remove any remaining fingerprints, sweat, and oils (and, in my case, a dog’s nose-print). This is where your microfiber cloth, hot breath, water, and maybe even a little spit come in. However, never spit on someone else’s guitar. That’s just gross. Only use saliva when cleaning your own guitar. Don’t rub or buff yet. Use a scooping motion to safely LIFT and pick up dirt. A microfiber cloth and your hot breath are often ALL you need to clean a guitar. If that’s not working and you’ve got something that’s really refusing to let go, slightly dampen a spot on the cloth with a bit of bottled water. Let me emphasize again: slightly damp. 1. Wet a microfiber cloth with bottled water. 2. The cloth should only be slightly damp. 3. Blot the damp spot against a dry spot on the towel. Finally, if water isn’t doing the trick, you can moisten the cloth with a bit of your saliva. Though it grossed you out, mom was onto something when she licked her finger and wiped that sticky smudge off your cheek. Saliva is nature’s universal gunk remover, and it makes a pretty good solvent for removing organic buildup like the sweat and oils. 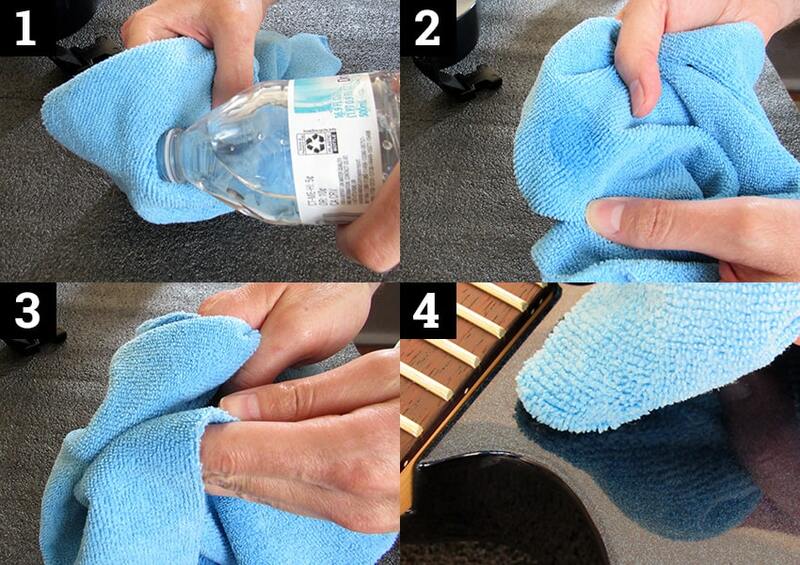 Continue this routine until you’ve removed all obvious dust, sweat, and oil from the guitar. 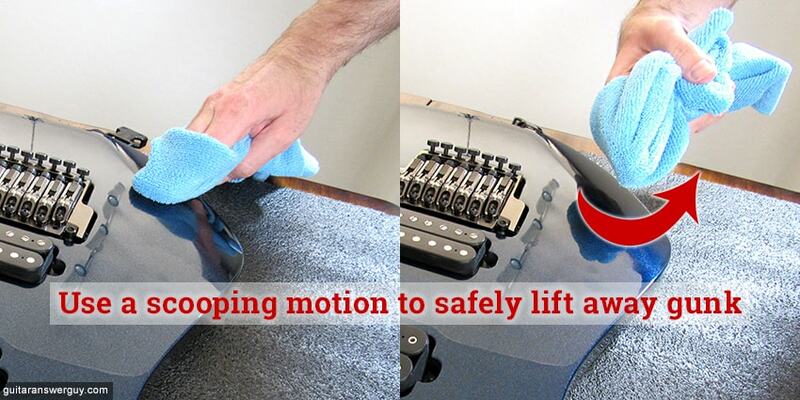 Once you’ve done that, it’s now safe to give your guitar a light buffing with a different/clean microfiber cloth. 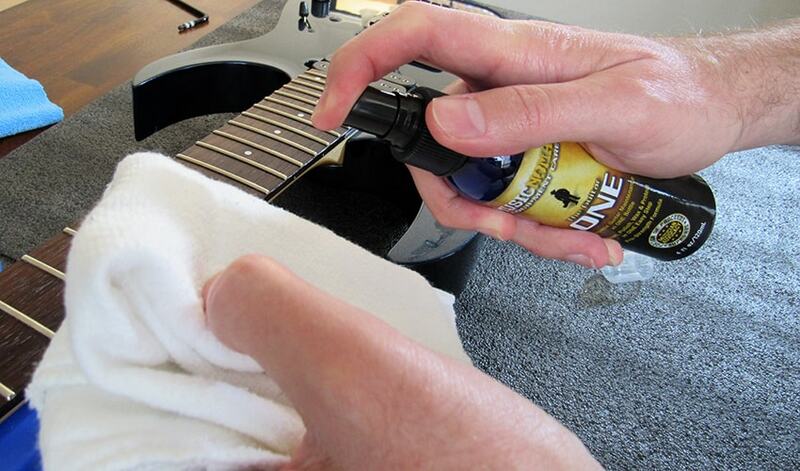 Once all that’s done, THEN it’s safe to use your favorite guitar polish. NOW you can safely apply your favorite guitar polish. 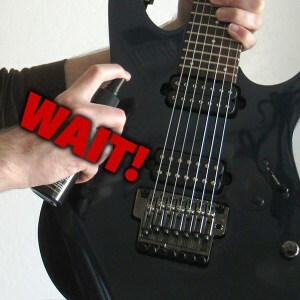 However, I generally advise using polish only a few times a year (about every 3-4 months if you play your guitar a lot). My favorite polish for gloss finishes is Music Nomad’s Guitar One Cleaner/Polish/Wax. However, if you’re guitar has a matte or satin finish, you’ll want to use Music Nomad’s Guitar Detailer for Matte & Gloss Finishes instead. For polishing my glossy finish, I’m using Music Nomad Guitar One and my favorite type of polishing rag: a well-washed cotton cloth baby diaper. 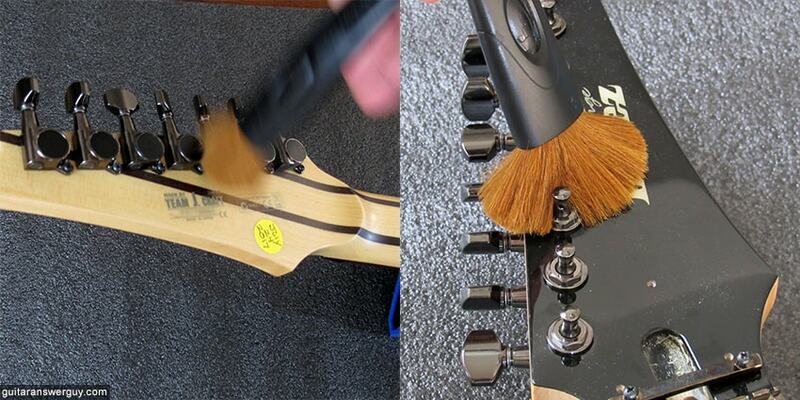 If your guitar has a matte/satin finish, you’ll want to use Music Nomad Guitar Detailer instead. 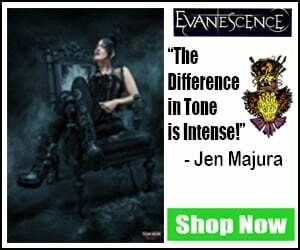 As I mentioned at the beginning of this article, do not use water, polish, or cleaners (or saliva) on your guitar if it has a “natural” finish. Though these natural finishes have been sealed with an oil or oil-varnish mixture, it only gives the wood a basic level of protection. This means that whatever you put on the wood could potentially find its way in… permanently. Sweat and oil stains from my forearm and fingers. Any attempt to remove these will just make those areas lighter or darker than the surrounding wood. Now, I love a natural finish, but over time the areas that come into frequent contact with your body will begin to discolor (get darker), and there’s not a whole lot you can do about it. You can use a dry microfiber cloth to wipe the guitar down after you play, but that’s about it. 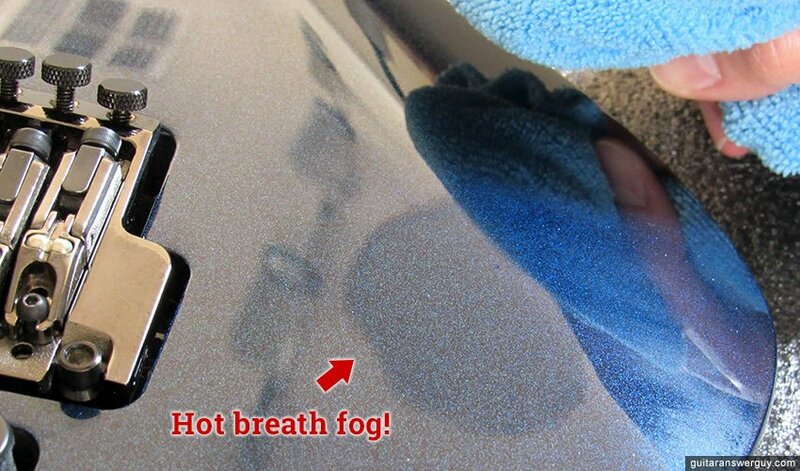 Sometimes, plain (clear) mineral oil can be used to remove superficial stains on smaller areas. However, just about anything you use to try and remove stains from a natural finish can potentially make that spot darker or lighter than the surrounding areas. This is just the nature of natural finishes. If you buy a guitar with a natural finish, do so accepting the fact that the guitar is going to pick up some mojo over the years. Be proud of that mojo. 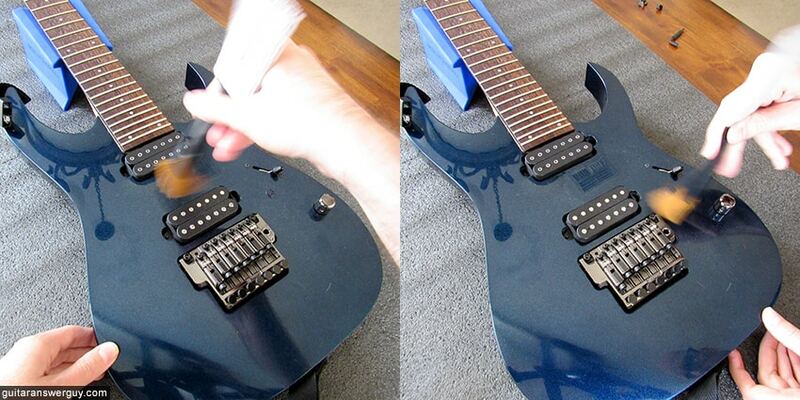 Don’t be lulled into a false sense of security and think you can use JUST guitar polish as a cleaner. You might get away with it for awhile, but eventually it’ll bite you–as your guitar gradually develops a dull haze or very fine scratches that you can’t remove. But what about the products labelled as “cleaners” you ask? After all, the Music Nomad Guitar One I recommend here says it’s an all-in-one cleaner, polish, and wax. What the heck? 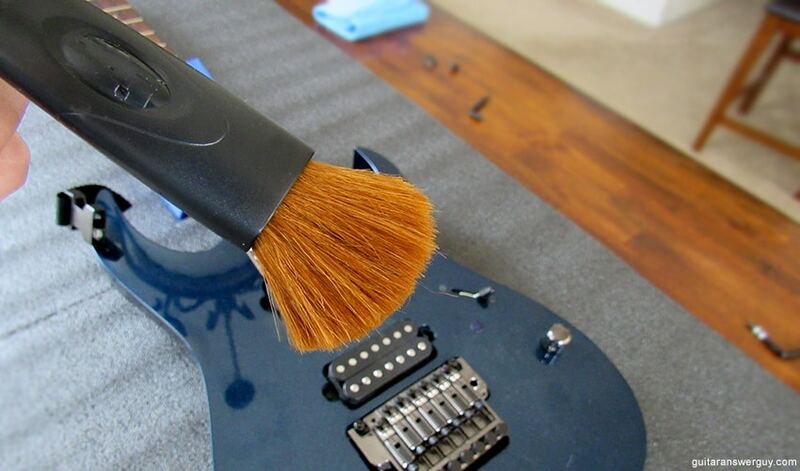 Technically, you can use the Guitar One product as a cleaner, but you should still dust-off your guitar first. Then, when you’re using the Guitar One to do the heavy cleaning, just be sure to use the “scooping” motion I outlined above. 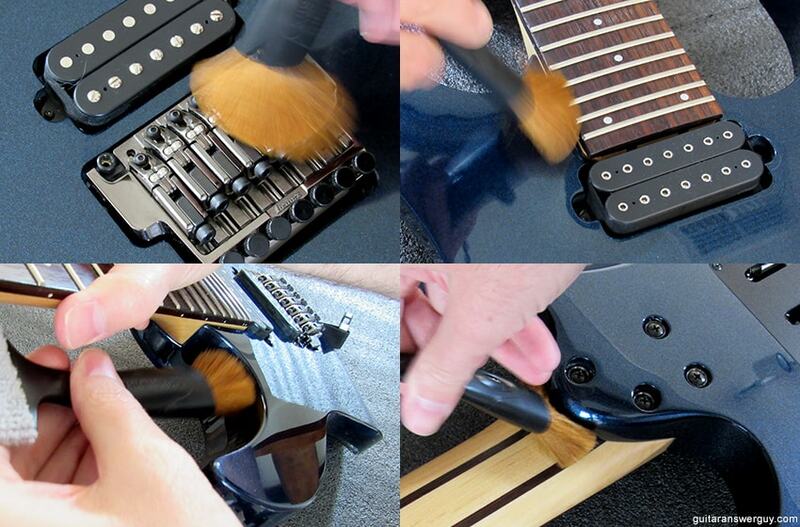 That’ll ensure you’re lifting dirt off the guitar, and not just smearing it around. What questions did I leave unanswered? Let me know in the comments section down below and I’ll do my best to help ya out. 1.after applying that nomad guitar one..considering that it has cleaner, polish and wax..do we still need to apply nomad guitar polish and guitar wax? i want to remove minor scratch on my guitar body and then protect the finish too..
so,can “guitar one” alone accomplish those tasks or should i buy also the guitar polish and carnauba? 2. have u tried planet waves 3 steps..if u have, how is it compared to nomad’s products? The Guitar One is meant to be an all-in-one, so you wouldn’t need to follow it with a separate wax. It already has wax in the formula, so it shines and protects. I personally don’t use it to “clean”… unless my guitar’s not very dirty. If my guitar’s pretty dirty, I like to clean first with water and/or hot breath, and then finish the whole job with the Guitar One to put the finishing shine on and leave a protective layer. However, Guitar One won’t remove scratches. For that, you’ll need something more aggressive like a fine buffing compound or swirl remover, but you have to be careful with those, as they actually remove a microscopic amount of finish. If used incorrectly, they can leave a hazy spot where you rubbed. Sometimes, you have to use multiple grits (each successively finer) to first remove the scratch, then get the lacquer back to an even, mirror-like shine. Can you describe to me how big/deep this scratch is? Can you actually feel it when you (carefully and lightly) run your fingernail over it? Once I have a better idea of how bad this scratch is, I can tell you what kind of product you can try. If it’s a really deep scratch, it may not be something you can do yourself. I’ve not tried the Planet Waves 3-step system, so I can’t say whether it’s any good or not. hi,thx u so much for the reply..
i can’t feel it with my fingers..however, i can see it only if i bring it under the light..oh,btw,the color is black. anyway,i asked Rand and he said that his “guitar polish” can help remove minor scratch..so,i want to give it a try too actually..but is it not too much?..i mean guitar one already has a polish too,right?i did ask Rand for this and he said that it is fine..do you think so? Rand is the owner of Music Nomad, so I’d definitely follow his instructions over mine. I’m familiar with some of their products, but certainly not all of them, and Rand knows his products better than anyone else. That said, I still wouldn’t use the Guitar One as a scratch remover. I think it’s just too mild. Rand is probably referring to the Music Nomad Pro Strength Guitar Polish, which may indeed remove that fine scratch. I’ve not used that product, so I can’t comment, but I’d trust Rand’s recommendation. I see in the description that it has “micro fine polishing compounds”… which is what you’ll need. thanks for the reply. Yes, he did mean MUSICNOMAD PRO STRENGTH GUITAR POLISH in his IG reply to me. He said to put the PRO STRENGTH first, and then, put the GUITAR ONE to clean and protect. so, i’ll use them both..GUITAR ONE for routine (once every one or two months) and probably just use PRO STRENGTH ocassionaly (probably only if i need to or only twice a year)..i hope it is ok.
Yep, that’s the process I would’ve recommended: buff the scratched area a few times with the polish first to (hopefully) eliminate the scratch. Once the scratch is gone, use the Guitar One to finish and protect–as well as for ongoing regular maintenance. 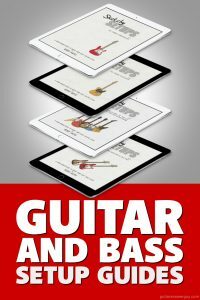 thank you Bobby..loved reading every bit of it more so bec I own like you,an Ibanez and a natural finish semi- acoustic Cort…have never unstrung my Ibanez electric and am pretty scared to do so coz it’s pretty new..
very useful blog for electric beginners like me..who would hv thought about saliva being of so much use on a guitar?